A comet zoomed by Mars today (Oct. 19) in an extremely rare close encounter that scientists billed as a "once-in-a-lifetime" event that may help researchers better understand the earliest days of our solar system. Comet Siding Spring came within just 87,000 miles (139,500 kilometers) of the Martian surface at 2:27 p.m. EDT (1827 GMT) today — about one-third of the distance between Earth and the moon. At the time of closest approach, the comet barreled by at 126,000 mph (203,000 km/h) relative to the Red Planet, NASA officials said. 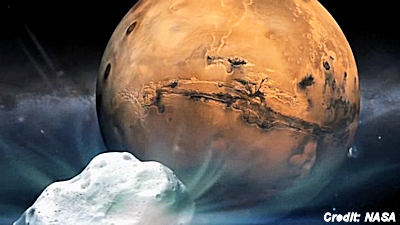 All seven spacecraft currently operating on or around Mars were scheduled to observe the close shave, with the aim of learning more about comet composition and behavior. "We cannot plan missions to comets like this — this one was discovered less than two years ago. It is incredible luck that it is saving us the trouble of going to it, as it flies by Mars, which is being explored by seven active robots," Mark Lemmon of Texas A&M University, a camera team member for NASA's Curiosity and Opportunity Mars rovers, said in a statement. "So this very much is a once-in-a-lifetime event, for us and our rovers." . . .